OpenXLR8 is the methodology we are actively developing that allows XLR8 and Snō users to develop their own custom Xcelerator Blocks and integrate them into the FPGA. We have integrated as much as possible of the design flow into the menu system of the Arduino IDE. However, the process still requires installing and using the Intel Quartus tool and Mentor’s Modelsim for simulation. Note: Creating a custom XB requires knowledge of Verilog/VHDL design and familiarity with Intel Quartus and Modelsim tools. Or, at a minimum, an adventurous spirit and the desire to start learning! We have done the best we can to automate as much as possible and are actively working to make it even easier as we refine the implementation. Want to see a detailed walk-through of using OpenXLR8? 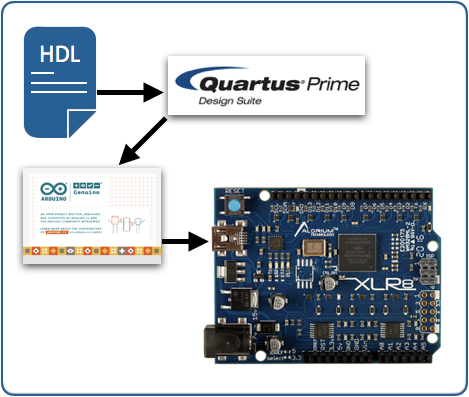 View the recording of our Intro to OpenXLR8: FPGA Design for the Arduino Ecosystem webinar here. Download and install the Arduino IDE as described in our Quick Start Guide. Download and install Quartus Prime 17.1 Lite Edition available from Intel here. Quartus tools are only available for Windows and Linux. This should include ModelSim-Intel FPGA Edition and Max 10 FPGA device support. Filter your search for XLR8. Install XLR8Core, XLR8BuildTemplate, and any other desired libraries. Make a copy of the XLR8BuildTemplate folder and name the copy XLR8Build. For more more complex cases such as multiple XBs you will need to instantiate multiple XBs inside of the openxlr8.v file and connect the to IO and each other as needed. Note: Synthesis requires Quartus, which is only available on Microsoft Windows and Linux (Linux untested). It is not available on Mac OS. Copy the URL that is printed at the end of the status message, paste it into a web browser, and leave us any comments you may have. Issues? Check the Alorium Technology Forums. Check out our Intro to OpenXLR8 webinar recording. Intel has both paid and free on-line training here. An overview of the ModelSim HDL simulator is also available from Intel here.